Experience your creativity free of judgment and reconnect with your inner self on these marvellous art therapy retreats a 10 minute walk from the heritage village of Gavalochori. The creation of engaging Cretian art therapist Penelope Orfanoudaki, they are held at her gorgeous private olive grove estate Bleverde, and mix art therapy principles with yoga, walking, gourmet food and visits to local artists to help you be mindful, express yourself and rediscover your inner needs. You don’t have to be ‘good at’ art to come, and you won’t learn to paint or draw here. Instead, expect an exciting creative space inside which you can get inspired. This inventive creative holiday cuts through all the stuff you might have been told since you were a child about your art making abilities, from the school teacher who told you your painting wasn’t very good, to the parent who said being an artist wasn’t a suitable career, to your own mind, which whispered, ‘unless it’s perfect, you won’t do it’. Instead, the clever team help you embrace your creativity and find true contentment inside it. You will need to share openly in communal discussion if you’re to get the most out of this retreat, which might not suit everyone. You’ll be fully supported though, and you can book a private chat during the retreat if you need to. 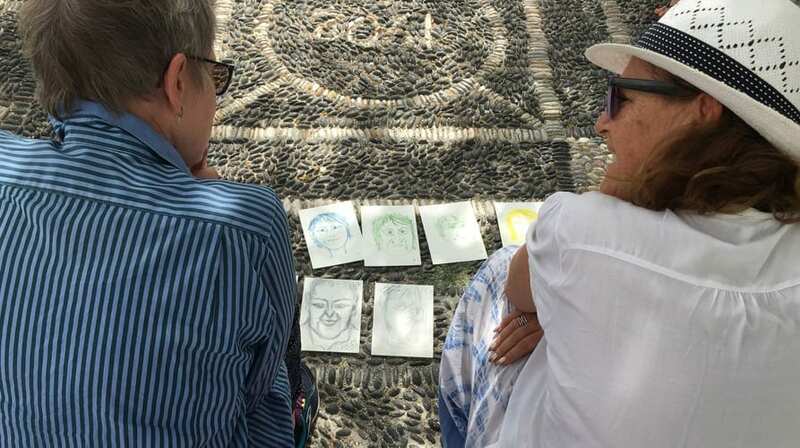 Caroline Sylger Jones reviews this art therapy retreat on Crete and discovers that ‘mark making’ is a refreshingly different, creative way to be mindful and reconnect with what’s important in your life. You’ll have a consultation before the retreat to establish what you want to achieve. Then on retreat, the day starts with either a swim, yoga session in the gardens or a mild hike, followed by breakfast. The day is made up of five to six hours of art related activities, punctuated by lunch and rest time. It closes with supper, either in-house or at a local taverna. Art therapy uses the process of art making to help you be in the present moment, access your inner thoughts and feelings, express yourself and subsequently change and grow in whatever way you might need. It is not about learning how to paint or draw. The activities mix fun and insightful creativity exercises and tasks which can be flexibly interpreted to suit you, and include inspiring visits to see local artists and architecture. Being part of a supportive, engaged group is a key part of the experience, and each day ends with a small exhibition and debrief of the groups’ artwork and an engaging sharing session supported by art guides. You only need share the thoughts and feelings you feel comfortable sharing, but doing so helps facilitate bigger changes if you need to make them. The lead therapist is Penelope Orfanoudaki, who completed her MA in Art Therapy in Singapore after an 18 year corporate career, an INSEAD business degree and a Bsc in Technology. As an art therapist she has worked in homes for children in Singapore and in the school for the blind in Hong Kong, and led artful groups for adults at Folkuniversitetet in Stockholm. Penelope’s team includes a clutch of her classmates from Singapore, including Romny Vandoros from Sydney and Huma Durrani from Singapore, both highly qualified art guides with extensive art therapy group experience. Maria, Penelope’s sister, an architecture student and talented ceramist who lives in Crete, offers a memorable ceramic session as a guest art guide too. The creative tasks draw inspiration from the local Cretian landsapes, architecture and artists. They include a visit to renowned local ceramist and naïve painter, Manousos Chalkiadakis in Paidochori, who lives a 30 minute drive away through small picturesque villages – you’ll hear him speak about his art in his exceptional restoration 14th century Cretan home and art studio. You also visit Chania’s venetian harbour, about 18 km away, which Penelope describes as ‘a warm palette of terracotta-coloured centuries-old buildings surrounding the blue of the sea’. As the focus of art therapy is enabling you to be in the present moment and achieve mindfulness, this is a great creative holiday on which to entirely digitally detox, laying aside for the duration of the week your smart phones and tablets. You’re likely to find it easy to disconnect as the art and nature take place of other needs or distractions, however, don’t come if you’re addicted to social media, or have an important work issue to deal with during the week. That said, there is a wifi you can connect to should you so wish. Each morning, to gently wake you up and aid the mindfulness process, there’s a yoga class at 8.30 am, led by a local teacher and accessible to all levels. The area of Crete where you stay, Apokoronas, is often called the ‘Tuscany of Crete’ because of its tranquil wide open views, olive groves and picturesque small villages, and it makes a wonderful place for walking, as well as being instant inspiration for art. There’ll be a few activities during the retreat that combine art with a walk – for example to a small fishing village, 4kms away, which has a sandy beach and cafe ( you can take a car here if you prefer). Contact with the sea is also an important element of the week, and the island has some really beautiful beaches of which you’ll sample two or three during your stay. The estate is only a 10 minute walk from the centre of Gavalochori, a heritage protected village with stone made houses, tavernas, a bakery and grocery stores. You’ll walk through the village the first morning as part of an art activity; this also acts as an orientation exercise. Then, depending on weather and group needs, you’ll walk into the village at least couple more times, including once for dinner. 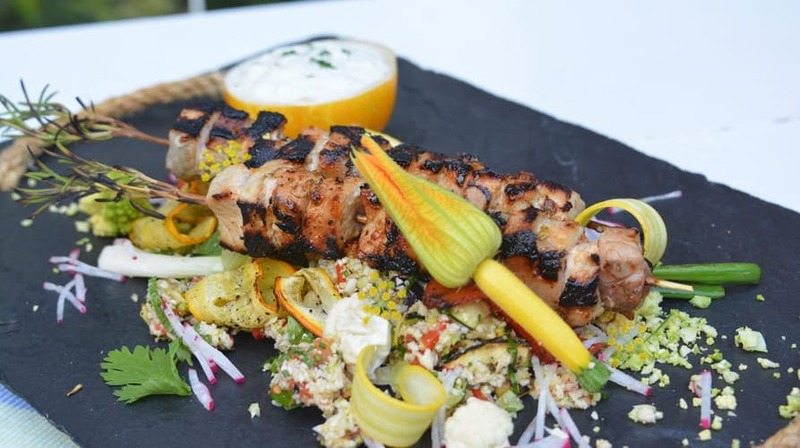 The experienced in-house chef, Neil Ciano, who cooks all your retreat meals, will happily talk to anyone interested about the food as he prepares it. One day you’ll visit the city of Chania, and have the option of walking with Neil in the central market to learn about local spices, healthy nutrition and local recipes. 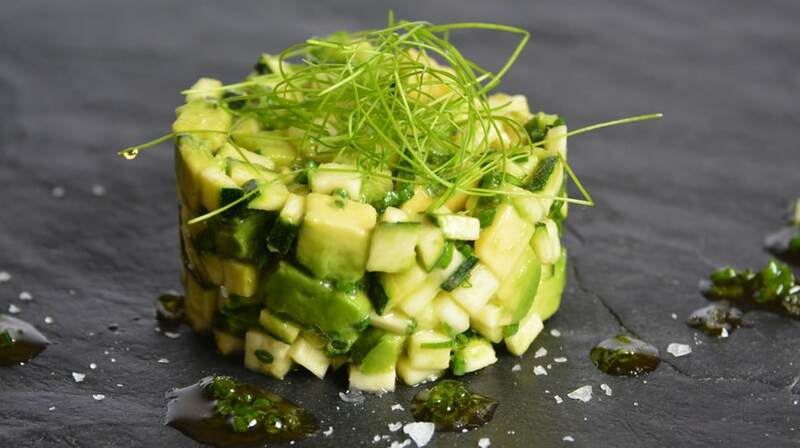 More formal cooking classes can be arranged at the nearby organic farm, where Artfulness sources the food you eat on the retreat. 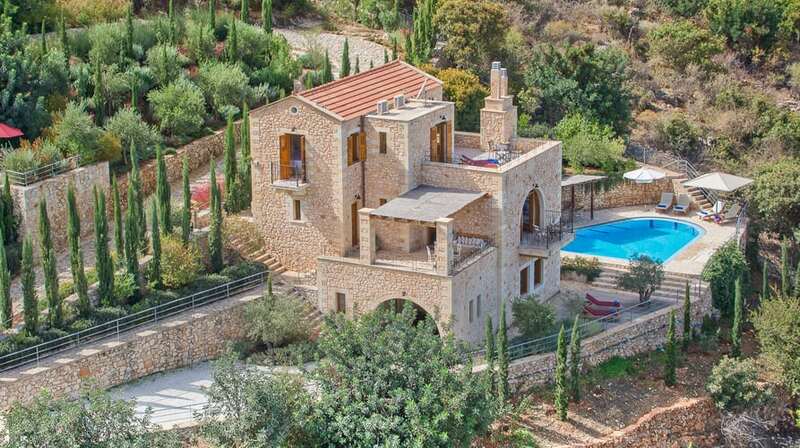 The villas: Bleverde estate, whose name is inspired by the blue of the sky and the green of the olive groves, is home to two private villas, Villa Elia, the original stone house, and the more luxurious and lavish Villa Levanda. 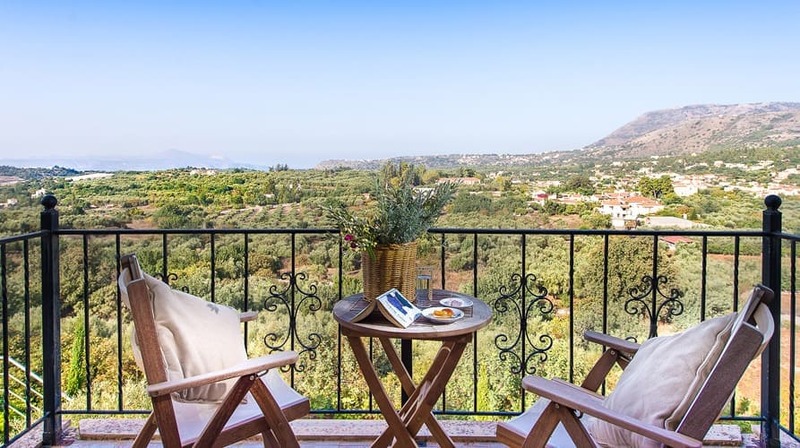 Each is surrounded by its own gardens with a stunning view over the silver-green olive trees and out to the distant sea. Each also has its own swimming pool – Elia’s is really for cooling off rather than swimming, and Levanda’s is big enough for lengths, though be warned that neither is heated. 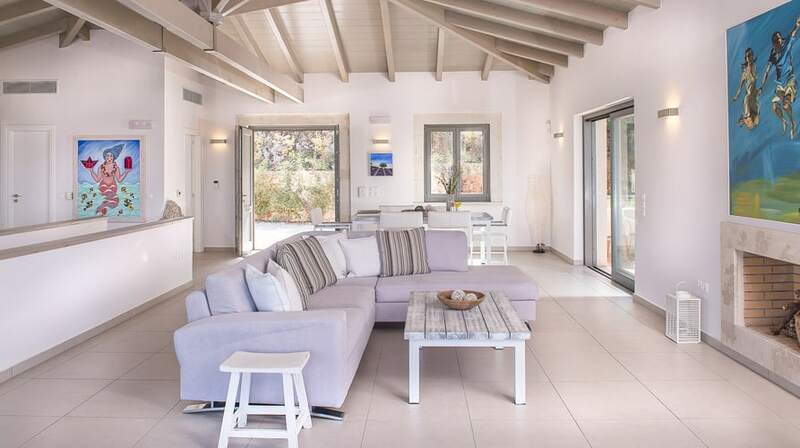 Both villas are filled with original artwork – paintings and photography – from around the world, but they do have a different style; Villa Levanda is more spacious, modern and minimal in tones of light grey, whilst Villa Elia is a traditional Cretan village stone house, and has a more cosy feel. No two of the charmingly furnished bedrooms in each villa are the same, but each have ensuite bathrooms and are equipped with Swedish Duxiana or naturally made Coco Mat beds and slippers. The best rooms are the two master suites, which have private terraces and spectacular views. Villa Levanda’s master suite (Luxury Private Room I), occupies an entire floor and offers the best of privacy. 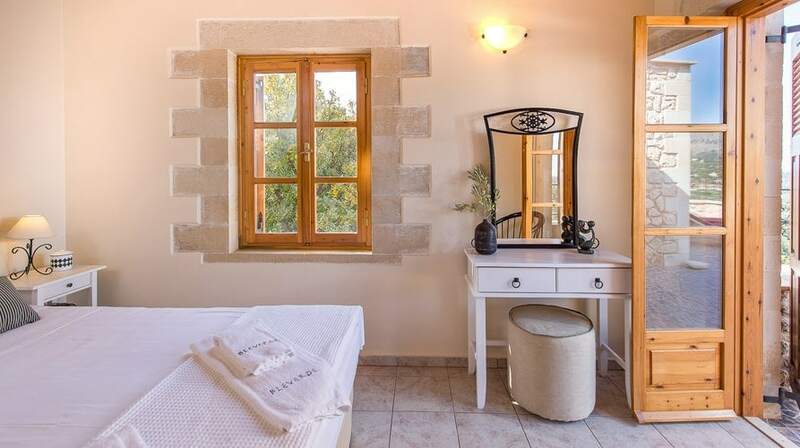 Villa Elia’s master suite (Luxury Private Room II) shares a floor with another room and has direct access to a big terrace overlooking olive groves. In total there are two single rooms and four double rooms, and the double rooms can be offered for single occupancy. Bathrooms come with shower gels, shampoo, body lotion, conditioner by Rituals. Other spaces to be: The estate’s mature gardens and multiple terraces offer a wide variety of areas for enjoying a private moment. There are several areas with benches in the gardens and seating areas around the pools, but it’s worth a walk up to the higher part of the estate to sit next to a century-old stone made hut (which was used to make cheese in the old days) from where you have the best view of the entire property. Yoga mats, bathroom toiletries, bathrobes, slippers and beach towels are all provided. The dress code is casual all day and into the evening. Art supplies for all activities are included and you’ll also get a personal starter art kit with a sketchbook and portable watercolours to take home with you. 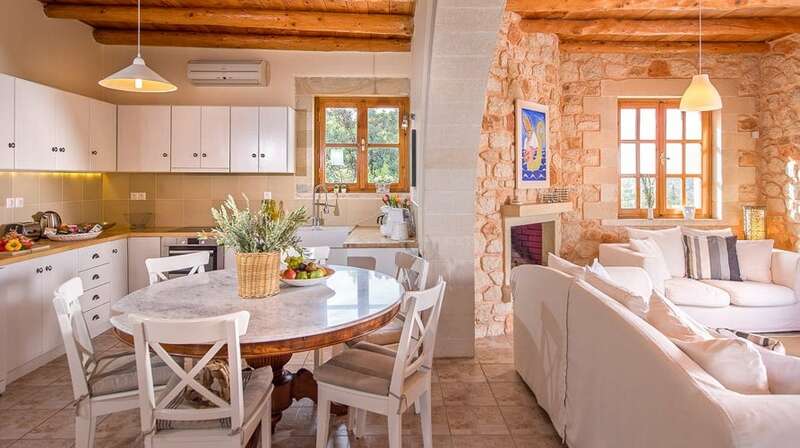 Fancy taking a little piece of Crete home with you? You can buy some local honey, olive oil or pick some herbs from Bleverde’s gardens. Early summer or late autumn are the best times to visit Crete when the weather is still mild and the light is great for painting and picture taking. In May the estate is very green and many flowers are in bloom, whereas October offers beautiful light and at times spectacular cloudy skies. May has great conditions for hiking but the pool and sea water is still fresh, so if you want to swim go in October. Workshop spaces: Most of the activities take place outside in the gardens and around the pool of Villa Elia. 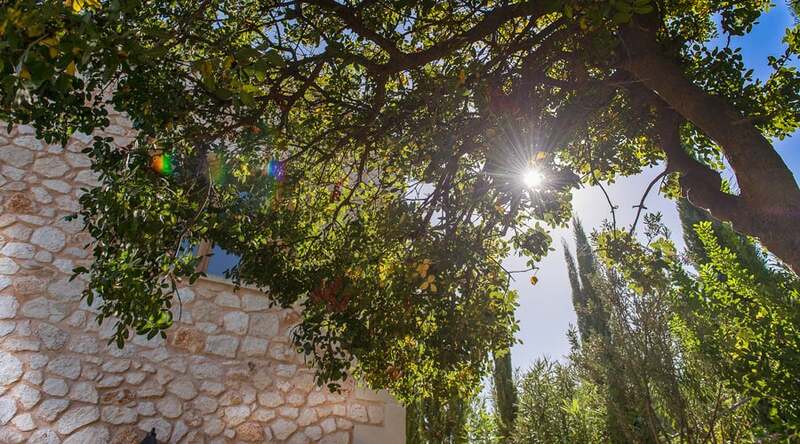 There’s also a cosy art studio on the bottom floor of this villa, which has stone walls and windows with views to the garden and the olive groves. The Gardens: The mature gardens are a source of tranquility and visual inspiration. As you approach the estate you can see a long line of cypresses framing the stone road leading to the property. 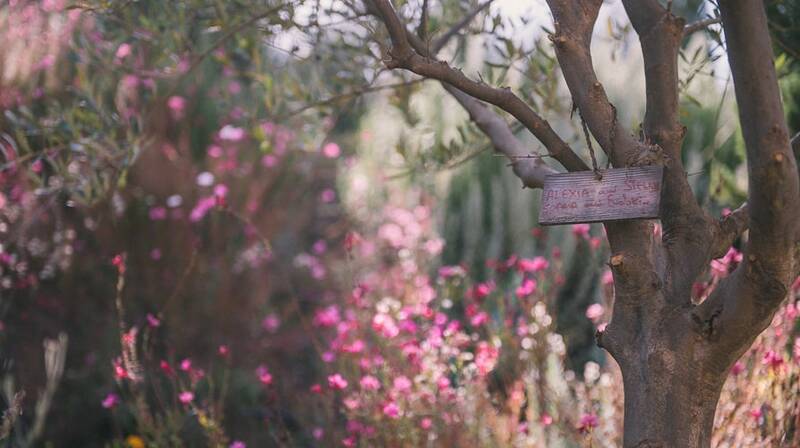 You’ll find olive, lemon, orange and apricot trees around the estate, all labelled with the names of the friends and family who donated them to Penelope and her husband when they got married. There are also a great variety of herbs and flowers bringing colour and scent to the land, such as lavender, oregano, rosemary, sage. Most meals are eaten al fresco, weather permitting, on Villa Levanda’s pool terrace with expansive countryside views. Dishes are prepared by the local taverna or a private chef, and feature Mediterranean dishes cooked with love. 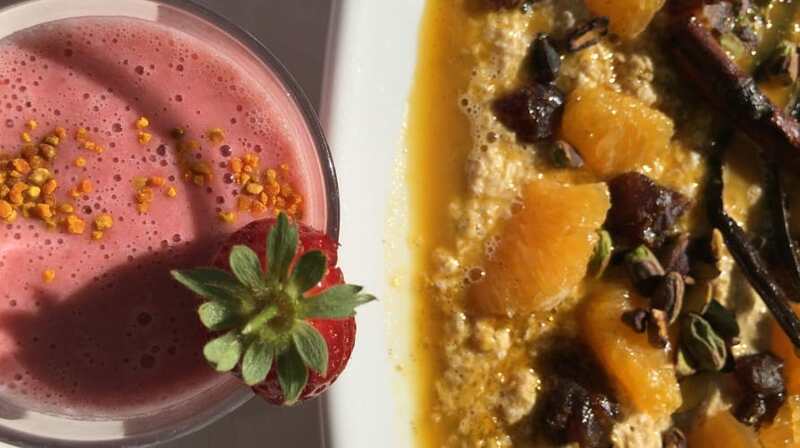 Ingredients are organic wherever possible, and special diets can be catered for. One or two glasses of wine are served with dinner. Stay hydrated on water, tea and coffee throughout the day – there might also be some local cookies left in the studio for a little boost between meals. 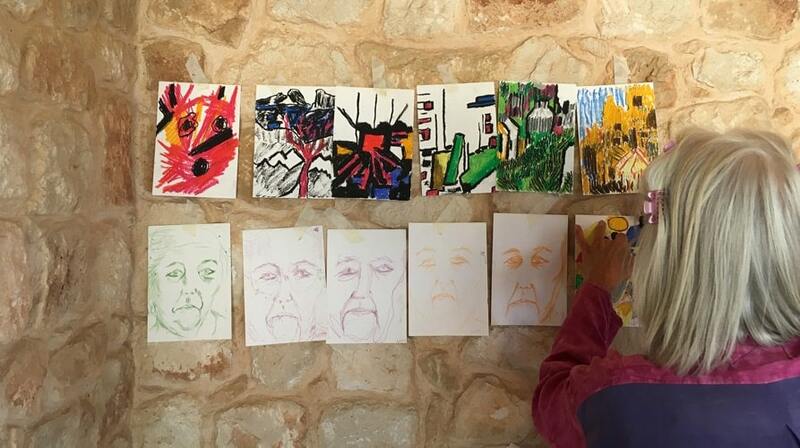 The economic and political crisis in Greece really took its toll on local artists, so Artfulness have made it their mission to support them by exhibiting their work both for retreaters to see, both on Crete and at retreats held in other countries. The company also supports under privileged children in Crete by donating a percentage of each guest’s payment to The Smile of the Child, a non-profit organisation with the most credible reputation for child support in Greece. The villas have energy saving air conditioning units, and solar power for hot water. Plastics and paper are gathered and sent off site to be recycled. Herbs are taken from the estate garden, and food is sourced at the local market and farms near the estate. Before: I didn’t know quite what to expect with the art therapy but the thought of 6 days in the sun in Crete accompanying my sister, providing her with some moral support, seemed a good enough reason to go along – she being the one into art therapy. Added to that we both brought musical instruments so we could play together. Also having dabbled with art over the years, but never producing much, I thought this would be an opportunity to produce something worthwhile … and I took along some books just in case. During: All the promises of the brochure were met – the beautiful Bleverde estate; the comfortable, airy rooms; the wonderful, delicious food; the interesting and absorbing art activities; and no need to be good at art either! But there was much more that wasn’t in the brochure. Very quickly I met and made friends with the rest of the group, and because of the openness of the exchanges in the art therapy, an empathy quickly formed between everyone in the group. How could this happen with people I had not known two days before? The direction of the two therapists was exceptional. The skill Penelope and Romny showed in drawing people out in an amazingly supportive environment, whilst at times dealing with some difficult emotions, could not be faulted. Yet they also managed to be challenging, getting you to think deeply about what you had painted and what you had said and what it meant. What was so fascinating and entertaining was the understanding which emerged so clear and meaningful both to the ‘artist’ and the observers. Literally the penny dropped with people on what it meant as they were describing what they had painted. I just didn’t expect things you unconsciously did to be so related to your character and outlook. I never would have expected it. And yet if this sounds like it was a bit heavy and serious – not at all! Most of the time we seemed to be laughing. It was an amazing experience and I looked forward to each day. Finally because of the relationship Penelope has with her various suppliers and partners when we went outside the estate on visits to the home of the distinguished potter and artist, the taverna, the medieval chapel, it felt we were visiting as friends rather than visiting as tourists. So it didn’t turn out like I expected at all. We did get to play the instruments – not only with my sister but also a delightful evening of singing and playing with the rest of the group. I didn’t get to read the books and didn’t get to do much ‘real’ painting, but instead I was totally absorbed and drawn into the activities – the painting, talking and even the yoga which I did for the first time. After: So what difference has it made ? I returned to England more focused and clearer about my own future. I have some brilliant memories from the holiday – watching migratory swallows swooping to drink from the swimming pool, walking back from the village after an evening meal under all the stars in the milky way; a firm feeling of friendship with the other attendees; a brilliant meal at Penelope’s secret taverna where the food the host promised would be on the menu was completely different from what his wife had actually cooked! Finally I amazed myself by completing 12 paintings on a family holiday 3 months later. I would definitely go again. Looking back on my stay at Bleverde – I remember exquisite days, offering the rare opportunity to disconnect from daily routines, and merely focus on my creative power. Bleverde artful retreat provided facilities that made it easy to express oneself freely. The other group members and our counsellors were extremely supportive and contributed to -on my part- that I felt safe and valued. The yoga lessons every morning initiated interesting processes, which I could profit from in my art making. The property – Bleverde – is located in an area which offers tranquility and beauty. To top it all – the food was amazing, healthy and very tasty!